New Adventures – Far From the Bahamas! Our last post was . . . well, kind of a last post about our cruising adventures for a while. After all, we were headed back to work and what would there be to talk about. Of course, we still didn’t know where we would be working and living. And where, pray tell, would Eleanor Q’s new home be??? Well, there’s more to talk about than we thought! And some friends have asked if we would consider putting some updates out about our new adventures . . . so we’ll give it a go and see how it turns out. Hope you enjoy. For this “series” of posts, I’ve created a new category. It’s called “Life in a Northern Town.” A northern town? What? Where? Who? Here’s the story . . . so far. In the last post we told you that Frank’s retirement was redefined (by him) as a sabbatical and that he was going back to work for his former company, but we didn’t exactly know in what location he would be working. Meanwhile, I’ve been picking back up on my consulting work. So when we got the call that his company had a “temporary assignment” for him, we were intrigued. Could we possibly go spend some time at their casino property in . . . Ontario, Canada! In the winter. It would probably just be for a few months . . . and something more permanent would come along later. They needed to start conducting a search for a new General Manager (or President, as it is called up here) and figured it would take a while to find someone and they didn’t want to leave the ship without a captain. (You think I’d pass up a nautical reference?) So being cruisers at heart, we’re open for exploring new places. A few months in Ontario? Could be interesting! And interesting it is. Frank started in January . . . I joined him a couple of weeks later, flying into Toronto. 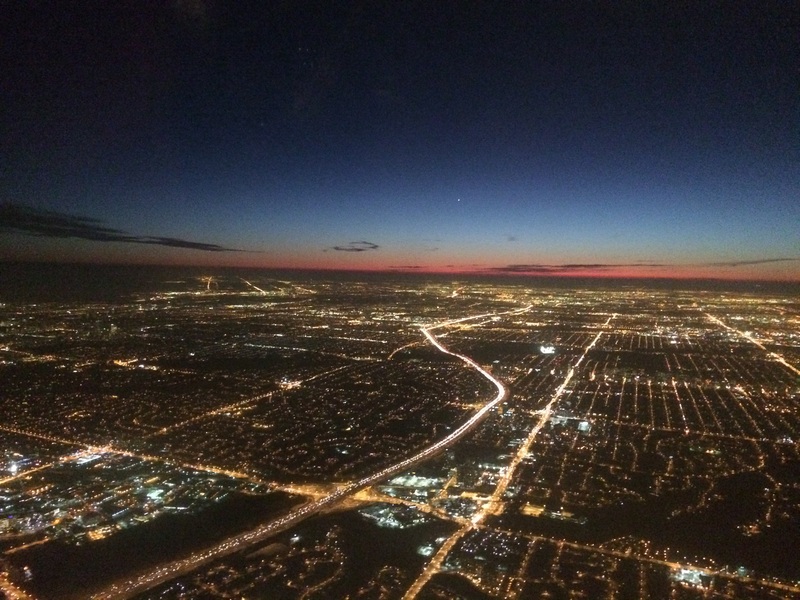 Sunset as I was landing in Toronto for the first time. I only stayed for four days on the first trip up. The second time I drove up with a car full of stuff. As I was getting ready for the trip, the song “Life in a Northern Town” (Dream Academy – 1985) kept popping into my head. Okay, it was more than popping in my head, it was completely stuck there! I downloaded as many versions of the song as I could find. That and some Gordon Lightfoot (a native of Orillia, Ontario) and my iPod was updated and ready for the trip. 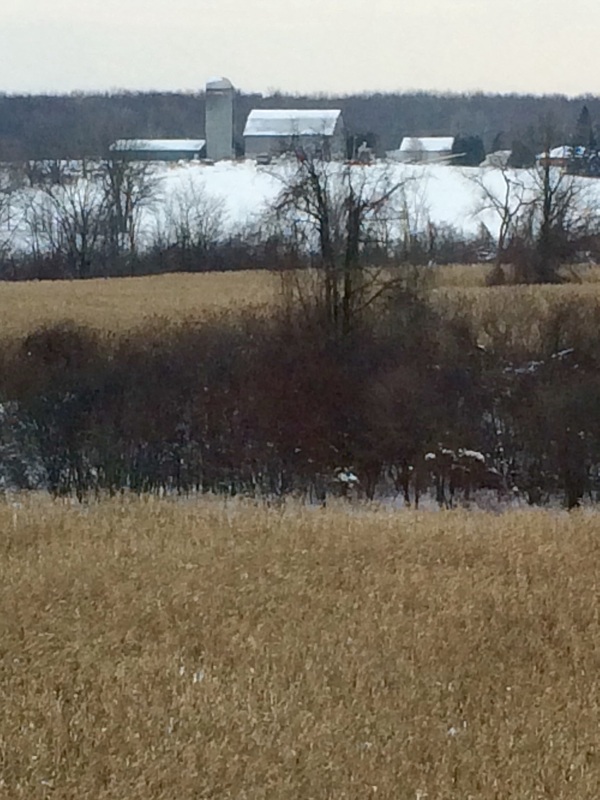 After an overnight stop in Buffalo, I came around the bend on Rama Road around midday to see our new home. 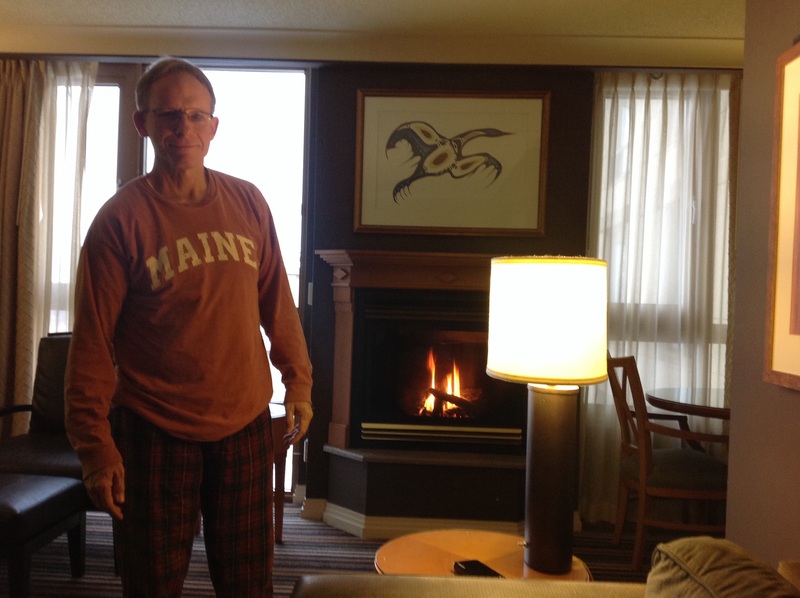 For now, “home” is a hotel room at the casino resort. We figure we’re uniquely trained for this assignment – we’re used to being transient and living in a small space together, and the room is way more floor space than Eleanor Q and has unlimited hot water! Piece of cake! 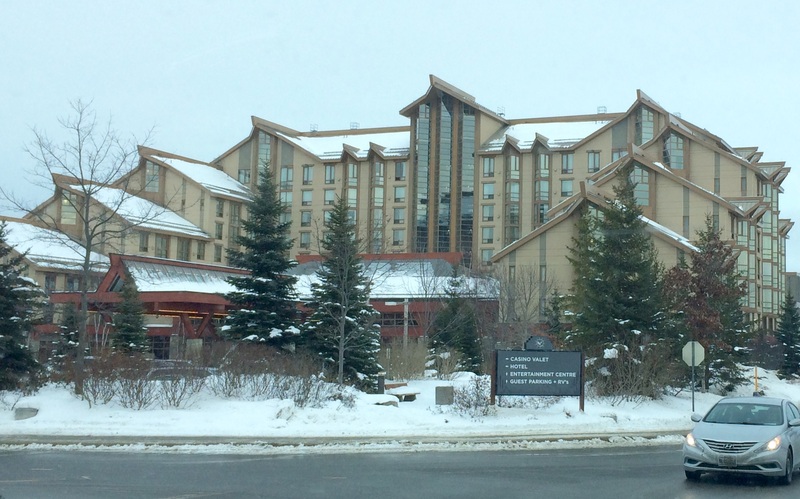 The casino is on First Nation’s land. (“First Nation” in Canada is the equivalent to saying “Native American”in the U.S in case you were wondering.) They are the Chippewas of Rama. (Rama is their town/land/property). 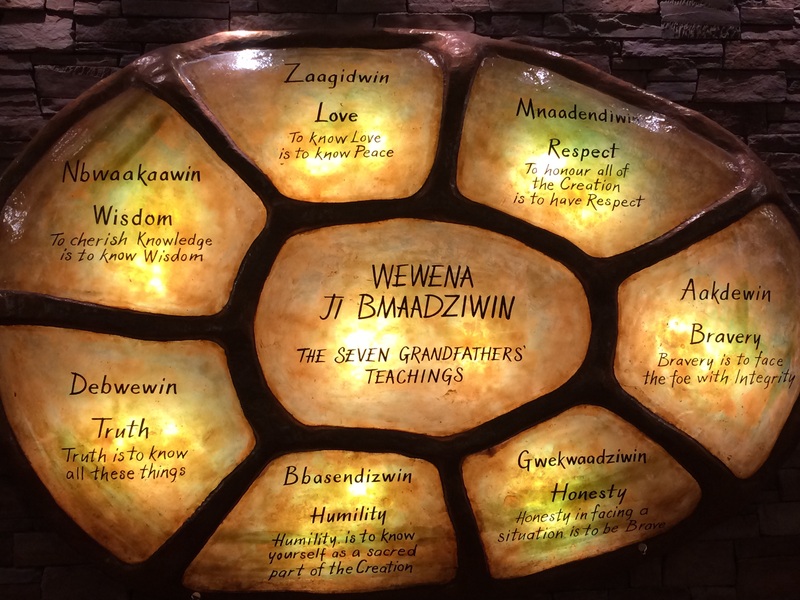 And so the resort very much reflects the First Nations culture and is beautiful! Lots of stone and wood and fireplaces. 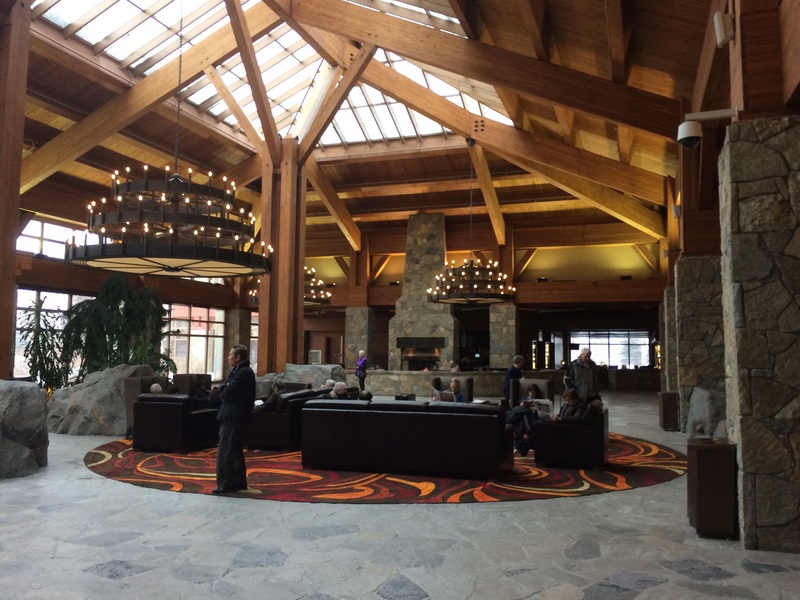 Looks like a giant ski lodge. 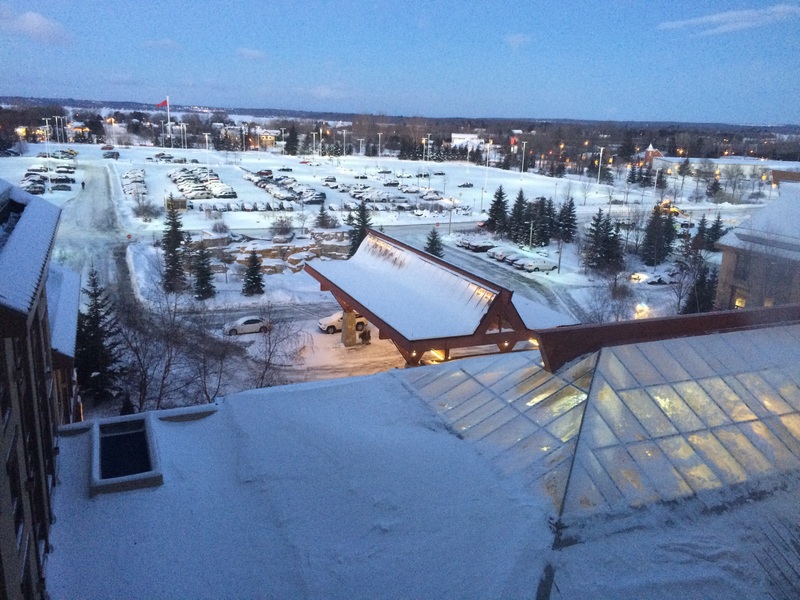 Orillia is the closest town of size and is just about a twelve minute drive away. 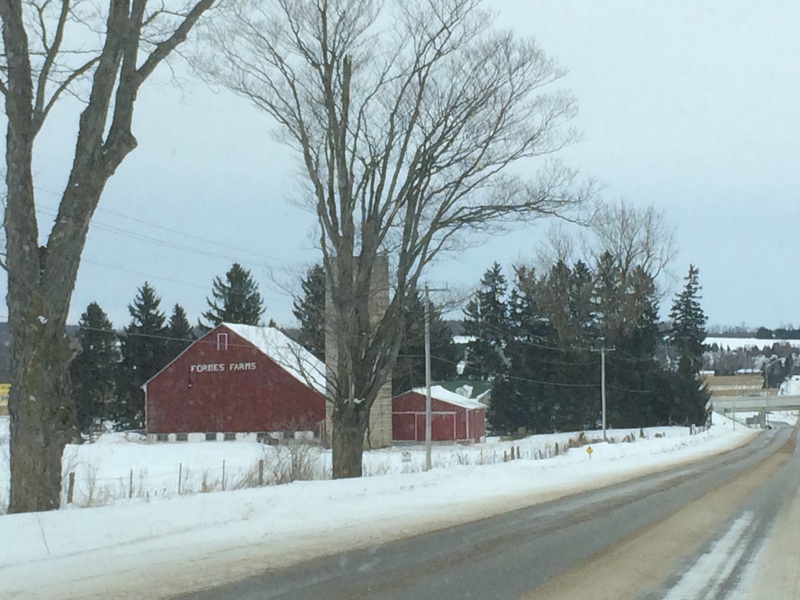 We are located about ninety minutes north of Toronto in Lake Country. (Notice that I am being careful to talk in terms of time instead of having to convert kilometers to miles!) We are told this is the Jersey Shore of southern Ontario. Lots and lots of water! It is difficult to picture right now, though, because the lakes are all frozen over and snow covered, but it is very picturesque. Let me take you for a tour . . . 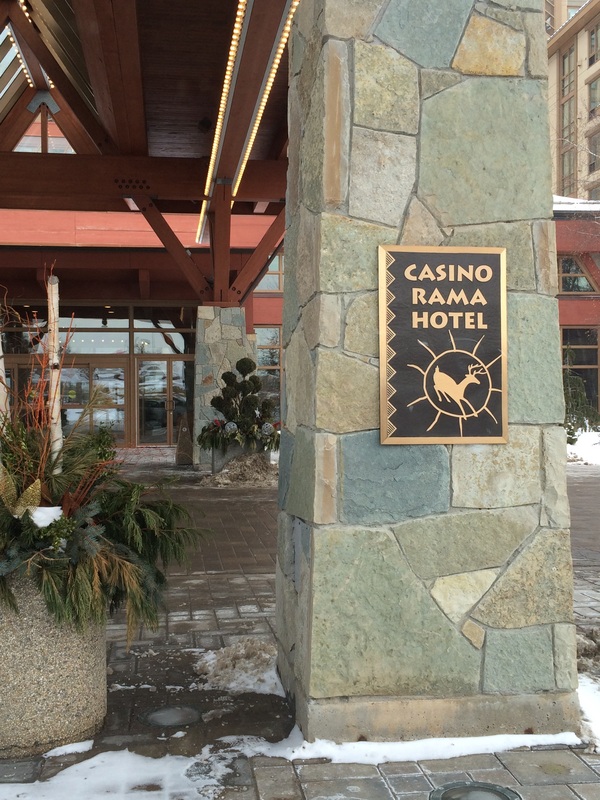 Welcome to Casino Rama – our home away from home. “Rama” is pronounced like the animal – ram. It is in Rama, Ontario. Every room has a fireplace, which comes in handy. The view from our room . . . 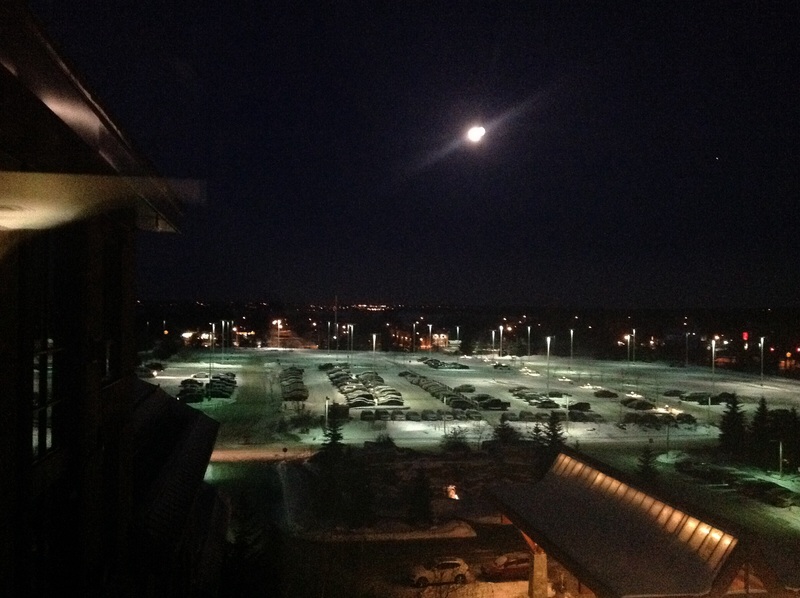 Which is beautiful during a full moon! The view out the window in the hallway going to the room. Farmland! 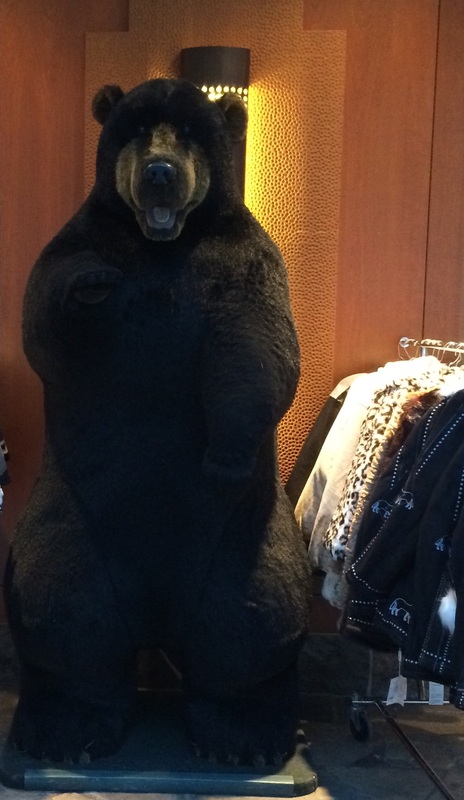 You gotta love a big stuffed bear! This one lives outside one of the shops in the hotel. And now for a little tour around the surrounding area . . . The town of Orillia is surrounded by lakes! 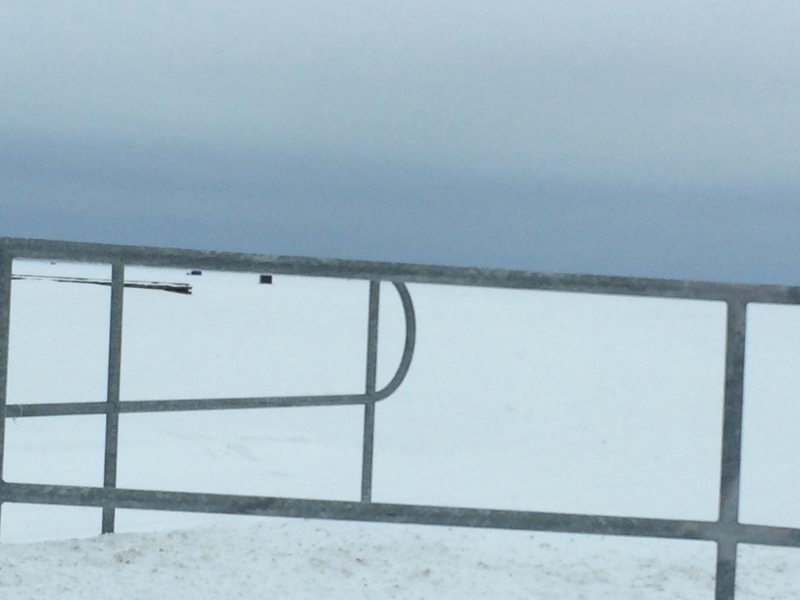 In the distance there are snowmobiles and and ice fishing huts. Yup, that’s the lake. 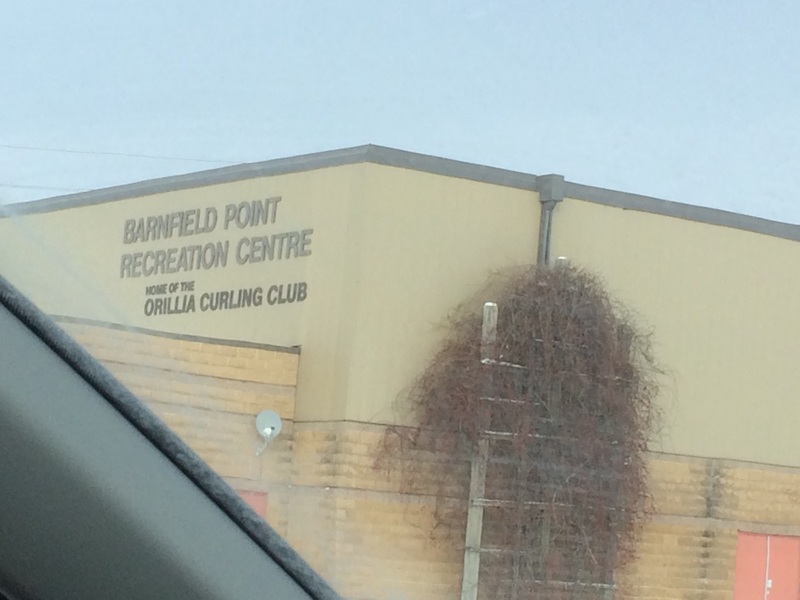 Curling is very big around here! And the Orillia Curling Club serves a mighty fine breakfast. Orillia is the town in these parts . . . a very quaint downtown area with interesting stores and restaurants. Looking forward to exploring it a little more. We took a 40 minute drive to Midland which is right on Georgian Bay, home to some of the best fresh water cruising, we are told. Georgian Bay is actually much larger than the Chesapeake Bay! We checked out a beautiful marina there. It could be a nice home for Eleanor Q if we found ourselves here for a while. Of course you can’t see the water for the ice and snow, but that is the bay and the marina is off to the left. Take my word for it. 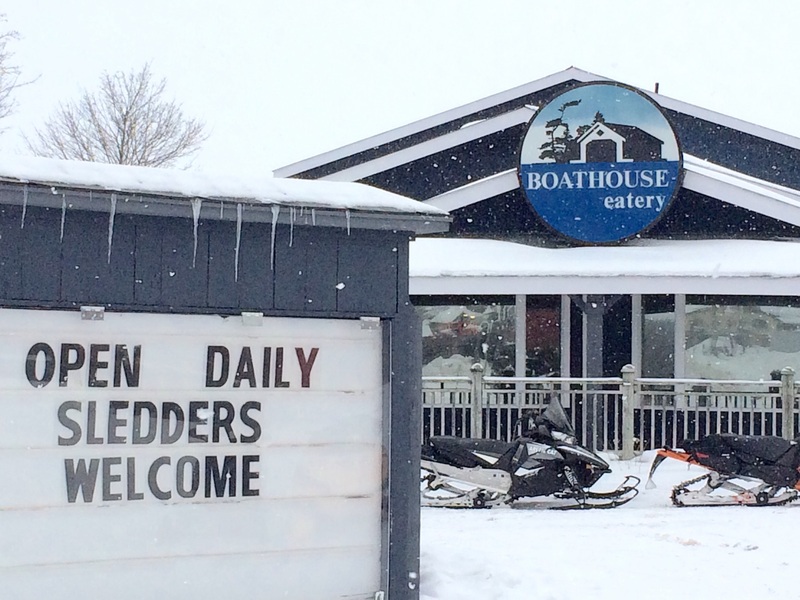 In Midland, we found a restaurant called The Boathouse. We wondered if it was open in the winter. The sign gave us our answer. And there’s the parking lot for the Boathouse! This is a typical mode of transportation around here. You see them everywhere. There are LOTS of beautiful trails all around. Barrie is a larger city located halfway between us and Toronto – about a 35 minute drive. We explored there one day, stopping by a park on the lake. Yes, that is the lake. 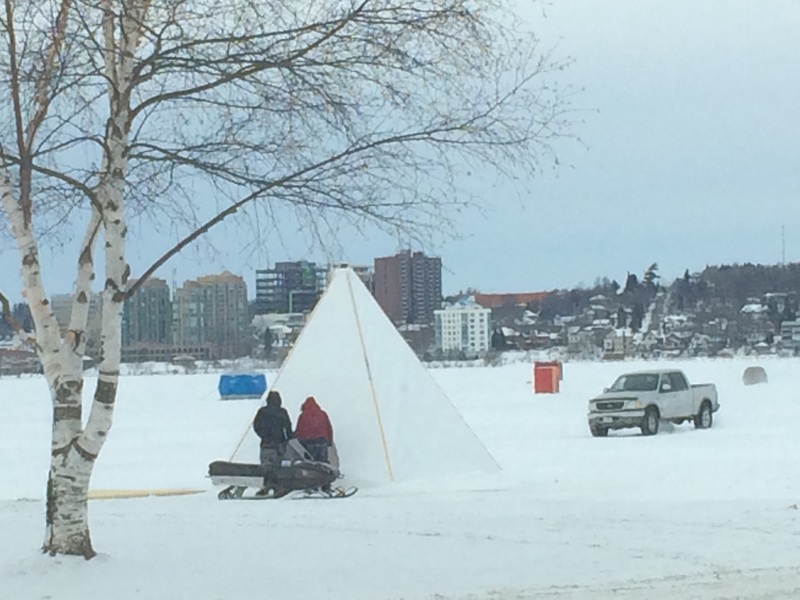 Those are ice fishing huts with the “sleds” and vehicles parked on the ice beside them. I cannot get used to seeing a pickup truck in the middle of the lake. 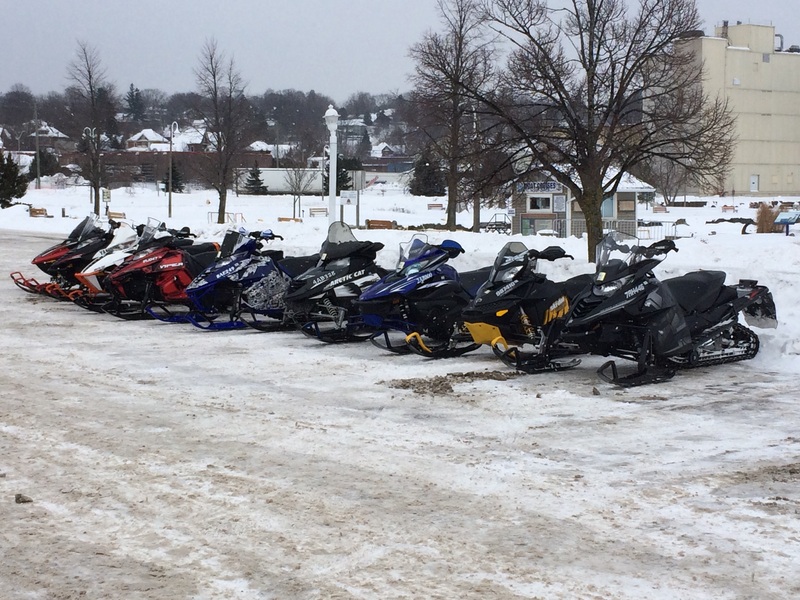 Ice fishing, snowmobiling and skiing are THE activities. And you have to learn about the important things like local lingo and signage. 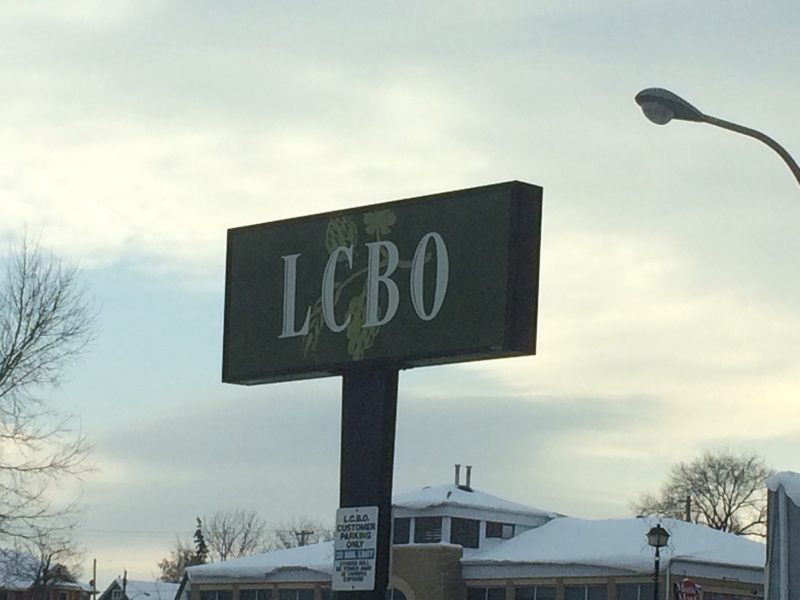 This is the Liquor Control Board of Ontario – the liquor store. You can find Jamesons, but you have to hunt for it in all the Canadian Club. 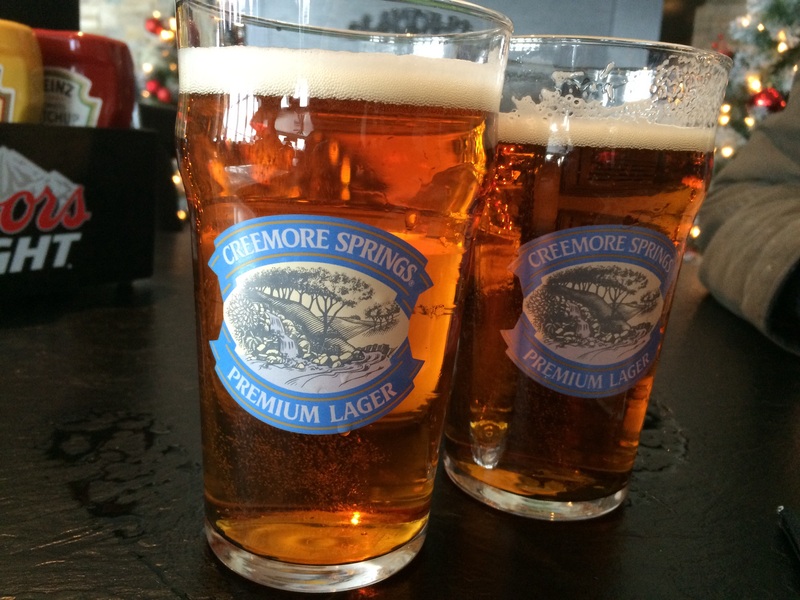 We have quite taken a liking to Creemore, a local brew. I did need to go shopping for some tonique! This area is not French-speaking, but you’ll find many of the products in the stores and some signage in both languages. And what brand of tonique did I get? 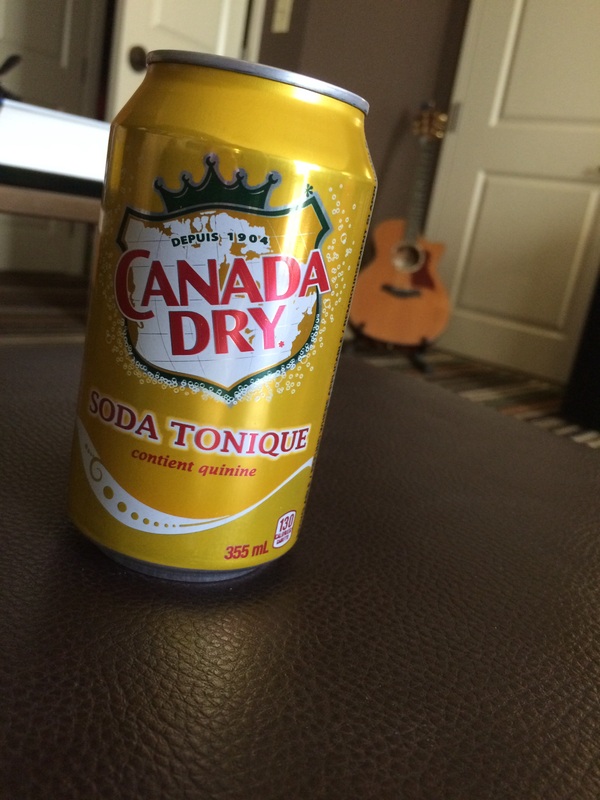 Well, Canada Dry. Duh! So far, people here have been tremendously friendly. The area is scenic. The culture is unique. There hasn’t been too much snow this year (relatively speaking) . . . but it is very consistently frigid! It doesn’t seem to phase anyone here too much. They just go about life dressed properly for the weather. It’s all about the layers for me! We don’t know exactly how long we’ll be staying here, but it might be longer than we had originally expected. But for now, we’re just living life in a northern town. This was a wonderful post. So happy I finally had decent internet in Black Point to log on . Thanks for sharing. The pictures are wonderful. Makes me want to travel someplace cold after we leave the Bahamas!